The Island Biševo is made up of limestone and has numerous sea caves along the coast of the island, which may be visited by boat. 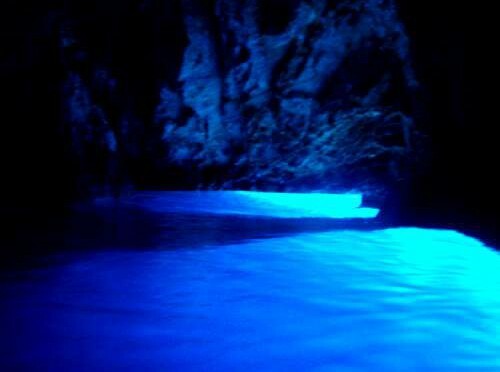 This cave picture here is Modra Špilja, the Blue Grotto. It is called Skuja na Zanje in the local dialect. The natural entrance below the sea level and you used to have to enter the cave by diving. But more than a century ago an artificial entrance was built to allow visitors to enter the cave by boat. Visiting in the late morning is ideal for a visit. This is the time when the light inside the cave is best. The earlier or later during the day, the less light in the cave. Before and after the sun hits the sea in front of the cave, a visit is absolutely pointless.